If you are a Liverpool FC fan, then look no further for a great range of official Liverpool FC duvets and bedding sets, rugs, towels, wall deocr and more. We also have lots of football related bedroom accessories to complete the look of your room. 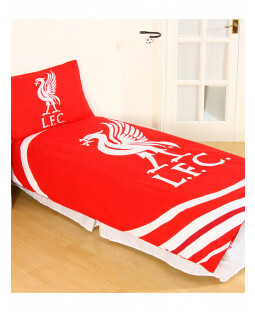 Turn your bedroom into a little slice of Anfield and you will never walk alone! Duvet covers and pillow sets in the iconic Liverpool red feature the club’s crest and come in sizes to fit your single or double bed. There’s even reversible duvet designs for 2 great looks in 1, and you can pair your bedding set with matching Liverpool FC curtains for the full effect. Turn your child’s bedroom into a little slice of Anfield with some finishing touches. Football themed décor including rugs, lamps and storage options help create a cosy and practical space, while metal street signs add a splash of Liverpool pride to your walls.